SAGE India Digest: Social media and elections—Perfect partners? Social media and elections—Perfect partners? India being one of the largest democracies of the world has a very interesting political history. Indian politics had very impressive and colorful personalities. Wooing the voters and convincing them to vote in their favor is not an easy job. There are various factors that decide the results of the elections. The first Prime Minister of India, Pandit Jawaharlal Nehru, won the elections with his message of development. Nehru sowed the seed of development in the minds of the people. And the rest is history. The 2014 Lok Sabha elections changed the way India perceived it to be and with 2019 elections around the corner, let us see what`s in store. Termed as ‘social media elections’, it made the largest democratic election in the world to date and so much of it took place online. 150 million between the ages of 18 and 23 were newly eligible to vote, two out of three people in India were under the age of 35 and there was an unprecedented voter turnout at 66.4 percent. India’s Internet penetration is currently estimated to be at 243 million or roughly 19 percent of India’s population. Narendra Modi and Rahul Gandhi, the two prime ministerial candidates, not only campaigned online but also built themselves a brand online. 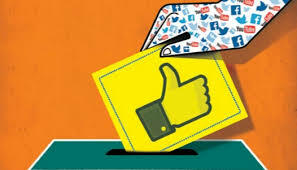 Social media also involves educating the voters on the election process, convincing them to participate in voting providing a platform to the stakeholders to share their messages and so on. “Social media has of late become a major source of news for traditional media players as well as subscribers or users. Citizen Journalism is also widely gaining ground”. Modern Media, Elections and Democracy analyses the intricate relationships between modern media and society in general and proceeds to focus the discussion on the role and performance of social media in elections. 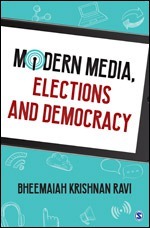 Know more about how media exerts influence on politics and expands the scope for political pluralism with our book Modern Media, Elections and Democracy.